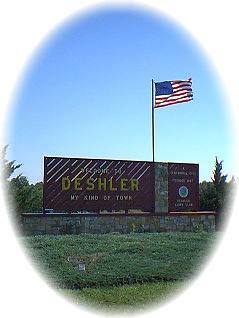 Deshler, just south of U.S. Highway 136, is located about eight miles west of Hebron, the county seat of Thayer County. The town was named for Ohio banker and landowner, John G. Deshler, who owned much of the land in Thayer County through which a railroad was to pass. The original German settlement, called Friedensau, was located two miles east and four miles north of Deshler. With the advent of the railroad, Friedensau was literally picked up and moved to the present day Deshler site in 1887. Growth for the new town was slow until 1890 when Joseph Steiner, a broom maker by trade, began working for general store owner H.J. Struve. Initially Steiner's brooms were sold only through the store. As the demand for these fine brooms increased, Steiner correspondingly increased the production by employing additional personnel. After Steiner's death in 1895, Struve incorporated and further enlarged the broom business. Over the years, as the business increased, the population and fortunes of the community also grew. Widely recognized as "the largest broom factory in the world," the firm reached the height of its prosperity in 1940, when almost 400 employees worked in Deshler, making a wide variety of brooms for home and industrial use. The factory had grown to 700 feet in length and two-stories in height. Fires in 1943, and again in 1946 and 1947 destroyed most of the buildings. Manufacturing of brooms in Deshler only recently came to an end, but the Chamber of Commerce hopes to be able to preserve the history that made the town. An industry making its home one mile west of Deshler is Reinke Manufacturing, founded by Richard F. Reinke, an innovative pioneer in the pivot irrigation industry. Many of the concepts that he originated have become the standard of the industry throughout the world. The company has developed into a global supplier of diverse and innovative product lines, including electrically driven center pivots, lateral move irrigation equipment, water management packages for corner irrigation systems, aluminum and steel flatbed and drop semi-trailers, and inter-modal container chassis. Deshler has a modern public school, operating in a new facility costing just over $2 million. There are two Lutheran churches and a Presbyterian Church within the community. The town also has a 58-bed nursing home, presently owned by the city. Over 90 percent of the streets within the business and residential area are paved. Deshler owns its electrical system and has no bonded indebtedness, including its water and sewer facilities. Annual celebrations that draw big crowds are Deshler Daze the second weekend of June and the Thayer County Fair the first week in August. The fairgrounds is also the host of the Thayer County Speedway. The Deshler area is very popular for hunting pheasant, quail, deer and other small game. Excellent cathfish and other panfish can be caught from the nearby Little Blue River. Located three miles north of this corner, near the Little Blue River, the village of Friedensau, "Peaceful Meadows," was established in 1874 by Lutheran missionary paster, John J. Kern. The town was first settled by his former parishners from Indiana and Ilinois. A scene of early century Deshler is painted on the side of one of Deshler's downtown buildings. The Thayer County Fairgrounds in Deshler boasts an unusual eight-sided Agricultural Hall built in1914. At one time, the building was used for plays, band concerts, movies, boxing and wrestling matches, and even high school basketball games.